1949 Kelvin-Quigg Malibu (also incorrectly catalogued as Simmons' Spoon) 9ft 10"
Manufacturer unknown. Surfboard, Hawaii c1949. Small pieces of balsa wood glued together to form longer pieces, much of the balsa wood used has come from WW II lifeboats. Small fin near the tails regions, rails are rounded off, 10 foot. sand paper, then fine. Plastic resin is applied. easy to make and thrilling to ride. By Edna Wood MATT KIVLIN, JR., of Brentwood, Calif., is not only a top-notch "surfer," but he also designs and builds surfboards in his home workshop. According to him, both safety and skill in surfing depend, to some extent, on using the right sized board - determined by the rider's height and weight. Standard length is about ten feet. If you weigh around 125 lbs., 3 in. of thickness is about right, 3 1/2 in. if you're 140 to 180 lbs., etc. Glued balsa timbers are left clamped together overnight, then lines are drawn, board is rough-hewn, shaped, smoothed, rough-sanded, coated with plastic resin which glues on Fiberglas. Top coat of resin is applied and allowed to harden dry before sanding. A coat of thick-gloss paint gives the board a perfect finish. 1. Matt Kivlin was an understudy of Bob Simmons. 3. No fin is shown or specified - probably an oversight. 4. Initial shaping with a draw-blade - preceeds use of planners and the surform blade. 5. Finished balsa blank is impregnated with resin before applying the cloth. 6. All resin work with brushes - preceeds use of rollers and squeegees. 7. The classic backyard board - shaped in jeans and thongs. Old sneakers worn for glassing. 8. 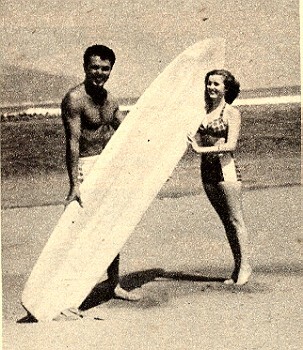 A surfing photograph, Waikiki circa 1940, accompanies the article - not reproduced here. A wonderful example of a Bob Simmons’ (1919-1954) ‘Spoon’ (USA), first constructed in ply covered styrofoam in 1947 (see image below) but quickly developed into the more common hand shaped balsa blank covered in fibreglass and resin. The rounded keel fin was standard for this model, although twin fin versions were also used. As noted the blank is made up of laminated short balsa lengths, recycled from WW11 lifeboats where it was used as buoyancy. The quality of the finish of the board suggests that it has a least been re-glossed and polished, if not completely reglassed. It is unlikely that this finish was technically feasible in 1950 let alone maintain it. If the board has been re-glassed then the original shape may have been modified. Lack of markings and/or decal is standard. Attribution ‘made in Hawaii’ is open to question, the majority of these boards where probably manufactured and used on the US mainland. See Notes on Fiberglass. This design was probably not used in Australia, but Australian surfers were aware of the design as early as 1953 on visits to Hawaii. It was the precursor to the Malibu board, introduced by the visiting US / Hawaii teams to the 1956 International Surf Carnival Torquay Vic., held in conjunction with the Melbourne Olympic Games. Team members subsequently visited Sydney. Historically this is a remarkably significant item. 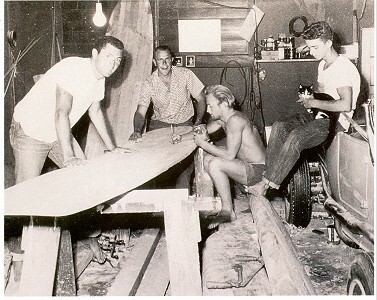 The construction pioneered by Bob Simmons of a hand shaped blank covered in fibreglass and resin and an attached fin is still the current preferred manufacturing method of surfboards today (1999). 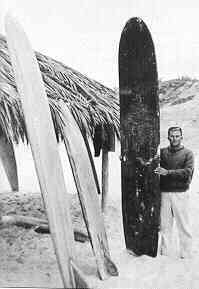 As Duke Kahanamoku is considered ‘the father of modern surfing’, Bob Simmons is considered by many as ‘the father of the modern surfboard’. Young, Nat with McGregor, Craig : The History 0f Surfing page 61. CONDITION: 10, if original glass. John Ewell with a Bob Simmons' early model timber/styro-foam laminate board, circa 1947. Surfing Vol 25 No. 2 February 1989, page 71 . John Ewell was said to be preparing a biography of Bob Simmons. Photograph in Curse of the Chumash, by Carlos Izan. This surfboard is not even close to a Simmons. The fin is not a Simmons either. It is certainly made of pieces of balsa with the assumption it is made from an old balsa Navy life raft. If it was a Simmons' spoon there would be a perfect semi circle on the bottom from the wedge. On top it would a straight glue joint. What happened during this time was that the Malibu board became a modified Simmons' with no wedge and a pointed nose. I have seen one board that had a pointed nose that had a wedge. A lot of people tried wedges, but never got it right. Simmons did not like pointed noses. This board does not have the strict parallellism that all Simmons have. Near the tail they of course pulled in somewhat. I don't think Simmons would even bother to shape such a board because of all the glue joints that dull tools and catch when it is shaped. My guess it is a Quigg board or Kivlin. They started to fare in the tails a little more later. The first modified copies of Simmons' were identical in shape except there was no wedge and pointed. Velzy said they did this because it was too hard to jig the nose and make the wedge. Morgan said they did want to appear they had copied a Simmons. I still have a 9 foot Simmons that I rode in 1950 with dual fins in mint condition. The clue to an authenic Simmons spoon are the circular glue joint behing the nose and a straight glue joint behind the nose from the wedge. The nose on top is dished out. Someone should straighten this out. There are plenty of misrepresented surfboards for sale. Note the upright multi-laminated balsa blank, left.